Taylor Swift and “Sparks Fly”… Why Am I Single? 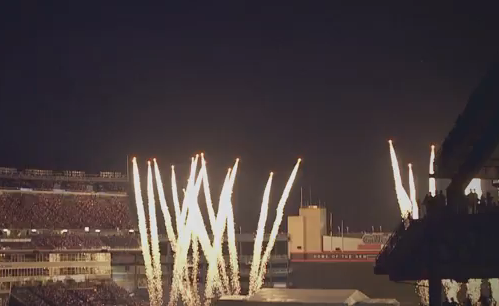 Taylor Swift and sparks flying... literally. Image via allthingscountrymusic.blogspot.com. Ah, Taylor Swift. The princess of conventional country-pop music that everyone loves to hate. She’s applauded for being ordinary and plain, which actually helps her image – her normalcy sets her apart from Lady Gaga, Katy Perry, Ke$ha, etc. No one can accuse her of plagiarizing other artists because not only is her style solely hers, but she writes all of her own songs, too. Not to say that she doesn’t use other celebrities to her advantage. Just look at Taylor Lautner and John Mayer. Those two acrid relationships resulted in two songs (“Back to December” and “Dear John”) that ameliorated the track list of Speak Now. And I doubt anyone could forget the ignominious Kanye West incident, which backfired badly and even bolstered Swift’s popularity. So am I a Taylor Swift fan? I’d say yes, because she’s a respectable artist and her songs can be pretty darn catchy. Though some of her songs, like “You Belong With Me”, and most recently, “Sparks Fly”, really make me regret not being in a relationship so I could make everyone feel completely jealous of my hot partner truly comprehend the depth of her soulful singing. She whips her hair back and forth, she whips her hair back and forth... a lot. It disappointed me. I’ve listened to “Sparks Fly” a decent amount of times since the album’s release and have come to love it, so I expected something more. Don’t get me wrong, the video is decent, but not as amazing as her previous productions. There was an inundation of cliche close-ups, pauses, etc. that caused the video to appear almost… sophomoric. Ha, fireworks. Just like in the lyrics. How literal. I’m sure I’m not the only one who would have preferred a poignant music video as opposed to one showing the concert experience. I’ve never been to a Taylor Swift concert so I can’t judge, but this lady found it lukewarm. Either way it would’ve been nice to see a more “Mine”-like concept due to the song’s strength and compelling quality. What do you think of “Sparks Fly” (the song or the video) and Taylor Swift in general? Same, I’m not totally love with her or her music but I like listening to her songs. Thank you so much, I really appreciate it. Anytime, I’m looking forward to following this blog- maybe I’ll find some new favorite music while I’m at it! I do see the connection – for some reason I like the actual song “Sparks Fly” over the song “Fearless”, but I prefer the music video for “Sparks Fly” over that of “Fearless”. “Fearless” seemed less cliche and it showed more of Taylor Swift’s personality rather than just her onstage performance. Pingback: Pop songs and relationships « A penny at a time. Just searched “The Best Day”, it’s a good song too! T Swift’s lyrics are well-written and soothing, I agree. Thanks for your kind words Ananya, I look forward to hearing more from you! oh T-Swizzle… i love to hear her songs.. during a break-up. or when im feeling extra cheesy. and i think that is fine! She’s a young girl like anyone else, like you said, and all of us can relate to her trials and errors in love. She has a good sense of what will make a hit, what sounds good lyrically/instrumentally, and she has a sort of raw-ness to her (is that a word) because she writes from the heart about real life. Hm… well I see what you mean about the comparison thing, I think people are quick to try to match others up to the prototypes in their minds (aka, blonde and curly hair -> Taylor Swift), though you can’t exactly blame T-Swift for that. And that’s true, a lot of her songs are about relationships. Personally, as a romantic, I don’t have a problem with that, but I can see how others might. There are some of her songs that aren’t specifically about relationships, like “Safe and Sound” and “Mean” and “Change”, and I’m sure a few others.